Picture Books – Not Just for Preschoolers! At one time in history, books with pictures were just for kids. Books categorized as jE (E for Easy or E for Everybody, depending on the library) are usually intended for parents to read to littles, for preschoolers, and for kids just beginning to read. There seemed to be an unspoken rule that people should read books with fewer and fewer pictures the older they were. Indeed, books categorized as jF (juvenile Fiction) – and intended for a slightly older audience – generally have more words and fewer pictures. Graphic novels changed all that with teens and adults voraciously consuming books with pictures! The truth is that picture books can be fun for all ages, and some picture books are going to have much more appeal for middle grade and teen readers. 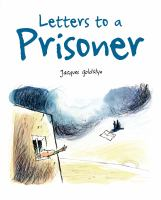 One of the newest books that will appeal to older readers is Letters to a Prisoner, a wordless book by Jacques Goldstyn. It is the story of a man who is arrested at a protest and imprisoned. He is locked away in a tiny cell for days, then weeks, then months. As time passes, he is sent letters, but these letters are confiscated. When several letters arrive together, they are burned and blow around to different parts of the world. Soon, many diverse people from all walks of life are writing to him in such volume he is able to make a fantastical escape. The author’s afterword tells about Amnesty International’s Write for Rights letter-writing marathon that inspired this story told in pictures. It is in our Children’s Department in the jF section. Indeed, many of the books in the jF section are there because they appeal to an older audience, not because they have lots of words. 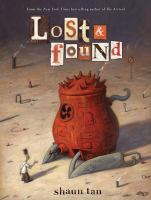 Another picture book for older readers is Lost and Found by Shaun Tan, also in the jF section. It contains three stories, told mostly in pictures, weaving together an emotionally touching view of the importance of loss and discovery. 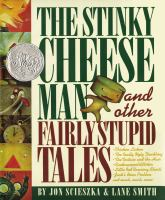 On a much lighter note, the classic jE picture book, The Stinky Cheese Man and Other Fairly Stupid Tales by Jon Scieszka was named a “Best Book for Young Adults” by the American Library Association the year after it was published. While it can be enjoyed by the youngest children, more sophisticated readers will catch some of the hilarious tongue in cheek shenanigans that make it such a delight. Posted in General, Kids, Reviews and Recommendations, Teens. Thanks so much for recommending Letters To A Prisoner. What an amazing. moving, inspiring book!